When you’re on a Good Thing it’s wise to stick with it. This is a philosophy that Damien Hornick follows when it comes to cars; as far as he’s concerned, late-model Supra turbos are da sh&*. And there’s no argument from us. 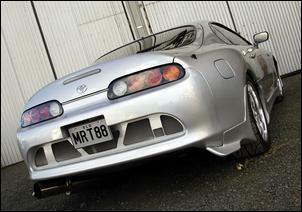 Damien previously owned a Mark 4 Supra twin-turbo tweaked to deliver 300hp (221kW) at the back wheels. This made for a quick machine, but what you’re looking at here is an easy 450hp (331kW) at the wheels monster – a damn quick machine! Damien purchased this Japanese-market Supra about two years ago. It came into his hands with a GReddy T88 34D single turbo kit (comprising a monster turbocharger, external wastegate and cast exhaust manifold), a huge Trust front-mount intercooler, 4 inch exhaust, ARC aluminium radiator and fiddled engine management. In this configuration, the Supra blasted out a sizeable 440hp (323kW) at the wheels while running 24 psi boost on a Dyno Dynamics chassis dyno. We’re not 100 percent sure what was done to the management, but Damien tells us the car never ran happily while in Australia. We can tell you the car was fitted with a remapped factory ECU and an AEM spark booster, but there’s a chance that an interceptor unit was also employed at some stage. Whatever the case, the poorly tuned engine suffered a terminal engine failure just 2 months into Damien’s ownership – cylinder number 6 melted. Rather than slip in a second-hand exchange engine, Damien opted for a rebuild with high-strength Aries forged pistons and Crower rods. These two mods increase the horsepower potential considerably, even though the rest of the engine remains stock – cams and all. Engine assembly is credited to Choice Mechanical in Toowoomba, Queensland. At this point, it was a good idea to get stuck into sorting the engine management. Damien junked the existing ECU for the latest MoTeC M600 programmable system. Electronic throttle and traction control have been lost but the engine is now tuned for maximum performance. The Japanese-fitted fuel system remains in service – there’s an aftermarket pump, 800cc Sard injectors and an aftermarket pressure regulator. In addition to the locally rebuilt engine and MoTeC installation, Damien has added a pair of HKS sequential blow-off valves, a K&N filter and heat bag for the turbine. 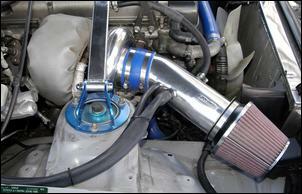 Boost pressure is temporarily controlled by a simple wastegate hose bleed. 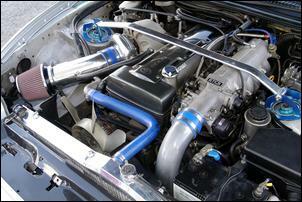 With these latest mods, Damien’s Supra produces slightly more power than previously - 450hp/331kW at the wheels. But instead of running up to 25 psi boost we’re now talking just 16. 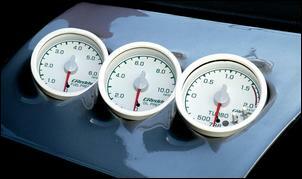 So there's more power on considerably less boost – a sure sign that the engine is running more efficiently. The task of channelling this amount of turbocharged power to the ground is a tough job - even for the sophisticated Supra chassis. Drive is channelled through a lightened flywheel, quad-plate OS Gikken clutch, stock Getrag 6-speed and LSD rear. Damien tells us the big 275mm rear tyres are easily overwhelmed by the stonking grunt of the Toyota. Suspension wise, the car had already been equipped with Ohlins adjustable coil-overs and Damien has added a Cusco front tower brace. But the brakes are where work is needed. The stock Supra twin-turbo anchors have been pushed past their limits and the rotors are now nothing more than shuddering pieces of scrap iron. Damien says an upgrade brake set-up – perhaps some big slotted Brembos – is at the top of his shopping list. 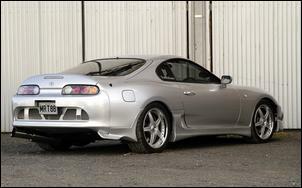 The body kit is a unique combination of off-the-shelf parts to suit the Mark 4 Supra. At the rear you’ll find an Abflug rear bar which teams with aftermarket front bar and side skirts. And, as you can see, there’s no towering rear wing. HFM Auto Styling can be thanked for the majority of the kit. Complementing the body are Racing Hart M5 18s. Inside, the Supra cabin is packed with a show-piece sound system. Pop the rear hatch and you’ll find an elaborately mounted Rockford Fosgate 15 inch sub and a pair of Rockford T1 amps – big fellas. The mid to high end of the sound spectrum is taken care of by Rockford Fosgate front splits and standard Toyota rear speakers. 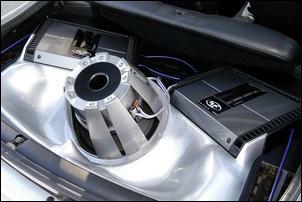 An Alpine CD/tuner resides at the head of the system. Toowoomba’s Hi-Fi Mart can take a bow for the loud and crisp music beats. Aside from the sound system, the cabin is decked out with a Hi-Fi Mart produced triple gauge pod containing Greddy boost, oil and fuel pressure gauges. Aside from some silver painted trim highlights, the rest of the interior is how it left the Toyota factory. 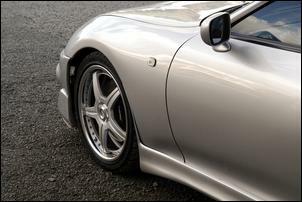 Although the big sound system adds a considerable number of kilograms to the Supra’s kerb weight, Damien says the car should be able to run a high 11/low 12 second pass as is. But its current level of performance isn’t particularly important to Damien, whose goal is to push the Toyota to around 600hp (441kW) at the wheels! With extra boost and perhaps some mods to the top-end of the engine Damien says this figure should be achievable. And what performance is expected with 600 ponies at the wheels? Well, if traction can be found, there are the ingredients to sprint down the track for a very low 11 second pass. Yep, we’re getting into drag car numbers! 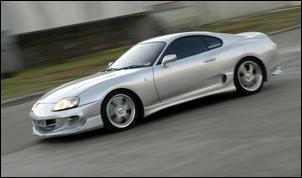 But if all goes to plan, Damien says he’ll sell the car in the next year or so and buy, you guessed it, another Toyota 6-cylinder turbo – either another Supra or a Soarer. But this time around it’ll make ‘only’ about 300hp (221kW) at the treads with strong useable torque, a big sound system, 20 inch rollers and body kit. Yep, its obvious Damien has found his Good Thing. Damien would like to thank Hi-Fi Mart, HFM Auto Styling, Troy from Choice Mechanical and Kyle for their help.